On Wednesday I woke to more showers which were blowing through on a building south-easterly wind. I made some breakfast and waited for them to pass. By the time the rain stopped it was about 6.30 am. The south-easterly was already blowing at about 15 knots and was forecast to get stronger through the day. There was not much point in trying to fish the headlands. The tide had been low at 5.00 am and had now turned in. I decided to fish around the rocks beside the boat launching area, on the edge of Woody Bay. This area, directly in front of the camp site, is sheltered by Woody Head. Even in a big south-easterly blow, it stays pretty calm. I decided to switch to my really light spinning outfit – Shimano Stella 2500 reel, Loomis GL2 rod, 1.8kg Fireline and a 10lb fluorocarbon leader. The bait that had been jumping around close to the rocks, had been some kind of small whitebait, so I chose a GULP 3” minnow soft plastic in the Watermelon Pearl colour, which would represent a similar profile. I rigged up the plastic on a 1/8th oz., 1/0 jighead. As I stood in the shallows, the water was warm and I started casting along the edge of the semi – submerged rock bars. At about 6.45 am the rain started again and just as it did, I felt the familiar double tap bream attack. I did not hook up but on the next cast, I did. I wound in another very respectable bream. I let it go and moved on, casting out and trying to rest my soft plastic lure, for as long as possible, right where the rocks met the sand. Just before 7.00 am I felt the faintest of grabs, as I hopped the lure along the bottom beside the rocks. Two more casts in the same spot produced nothing. On the third, the rod bent over as the jighead stopped dead. It felt like the lure had stuck fast in the rocks but then very slowly the ‘rocks’ started to move. In a long slow run the fish moved about 6 metres to the south. Then paused and did the same thing again. I pulled up on the rod and tried to recover some line. It was only at this point that the fish realised that it was hooked and started really fighting. It was still so slow and heavy that I thought it was a ray or shovel nose shark. After a few more lunges it turned towards me and rose to the surface shaking its head. I could now see it was a big flathead. With a ten pound leader I could not risk any abrasion from the barnacle-covered rocks so I let the fish play itself out. It had been lurking in less than 30cm of water so it was hard to keep its head down but I took my time and used the swell. 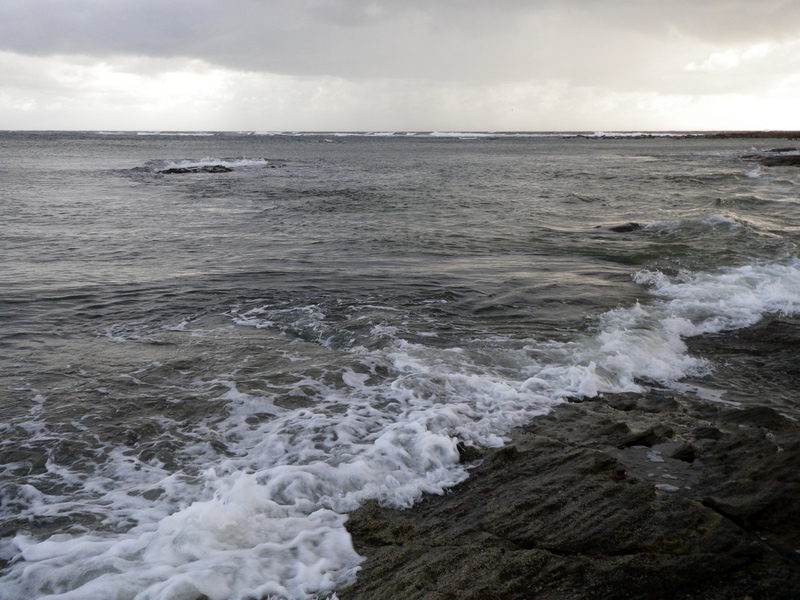 I found a nice sloping rock bar and gradually eased the fish up in a breaking wave. It was a nice flathead who measured up at about 74cm. After a few snaps I put her back and she swam away. The Clarence River is still very de-oxygenated and full of fresh water from the floods. It is likely that all sorts of species (including flathead) have settled around these headlands to wait for it to clear. The birds were very active, constantly swooping in to pick up baitfish. So it looks like a fair amount of bait has also been washed out. I decided to wade around the shallows in the bay and look for some more fish. I was soaked from the rain and being in the water was warmer than being out of it. I tried all around the rocks with the same soft plastic and a few others, to see if I could find anymore flathead – but I couldn’t. I watched a few long toms follow my lures in and have a snap at them, but did not hook any. I swapped over to one of my favourite DUO hard bodied lures. With the river out of bounds there was not much water where I could use their range of finesse lures, but this bay was flat enough and clear of weed, so it was perfect. I tied on the DUO Ryuki Spearhead 45s in a gold/ green colour. This is a small trout lure that seems to work well on bream. It weighs 4 grams and is 45mm long with a small bib. As with most of the DUO range it casts a long way and slips into its action almost as soon as it hits the water. Although it is technically a sinking lure, its lightweight means that it effectively suspends, when you pause the retrieve. I cast it over the flats and around the rock bars as the tide rose. First it attracted a few undersize moses perch. Then, as I moved into slightly deeper water I found a patch of small bream. I caught a couple before they decided they had had enough. At about 10.00 am I found myself almost back where I had caught the big flathead earlier. I had waded round the bay in a big circle. I continued to cast along the edge of the rocks and suddenly felt a solid hit and run. The fish was hooked and after a few good runs it calmed down and I pulled it up to the sandy beach. 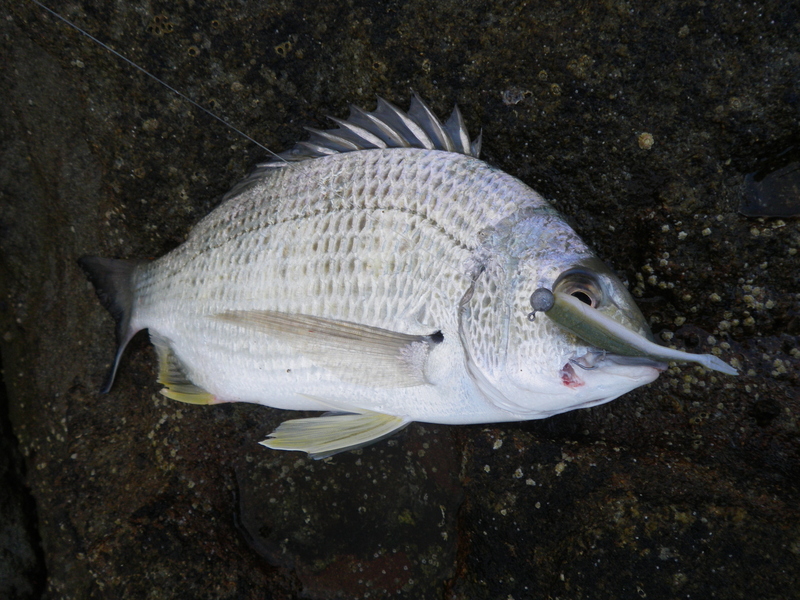 It was another good bream – just over 35cm long. I released it and carried on fishing for about another hour with no luck, so I decided to give up for the morning. This entry was posted in Fishing Reports, Iluka and tagged catching flathead on soft plastic lures, double tap, DUO Ryuki Spearhead 45s, fishing soft plastics, Flathead, Flathead on soft plastics, GULP, land based, landangler, landanglers fishing reports, minnow, nature, outdoors, rock bars, woody bay, Woody Head. Bookmark the permalink.